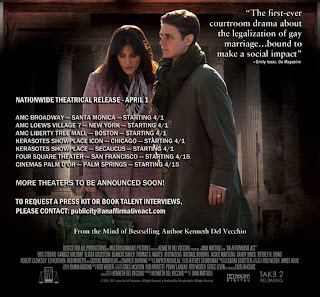 Controversial courtroom drama "An Affirmative Act" hits theaters nationwide Friday April 1st 2011. From the mind of best selling author/producer Ken Del Vecchio comes a film based on the legalization of gay marriage which could possibly have Academy Award written all over it. An Affirmative Act is a powerful film that will keep you on edge and is our pick as a must see! A slice of life of a young, professional married couple with their darling baby turns a sharp, dark corner when the pair are arrested and charged with several counts of fraud. The reason: Terry and Samantha Succi aren't the man and woman that they purported to be. In truth, they are two women. One, a long haired, pretty school teacher; the other, a boyish-looking architect, who tricked the world surrounding her into thinking she was a man.One affirmative act, deciding not only the fate of the women's freedom, but also the governor's bill and one of the most controversial issues facing the United States. 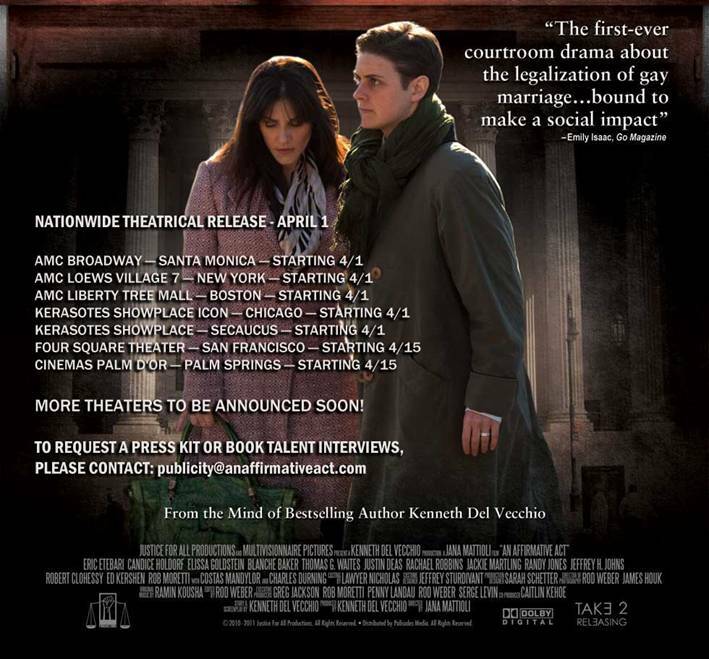 One affirmative act - of justice, or maybe not…all of this and more as “An Affirmative Act” hits theaters. Directed by Jana Mattioli, the film stars Elissa Goldstein, Candice Holdorf, Eric Etebari (Witchblade, Lincoln Lawyer) Emmy Winner Blanche Baker, Jackie "The Joke Man" Martling ("The Howard Stern Show"), 6-time Emmy winner Justin Deas, Rachael Robbins (The Great Fight), and Keith Collins (A Fight For Survival, Games People Play), who add comedic moments to the drama; LGBT standouts Randy Jones (Cowboy – "The Village People"), Rob Moretti (Crutch), Jeffrey H. Johns and Greg Jackson; and veteran Hollywood actors Costas Mandylor (Saw movies, The Pledge), Thomas G. Waites (And Justice For All, The Thing), and Robert Clohessy ("Oz", "Boardwalk Empire", "Hill Street Blues"), joining the legendary Charles Durning(2-time Academy Award Nominee).